Native American Jewelry/Turquoise Jewelry/Sterling Silver and Gemstones at The Turquoise Mine. Welcome to The Turquoise Mine! Your source for authentic Native American and handmade gemstone jewelry. On our site you will find high-quality Native American Indian Jewelry along with unique handcrafted turquoise and gemstone jewelry treasures- adorned with red coral, sterling silver, lapis lazuli, amber, jet & spiney oyster shell - just to list a few. We have a love for turquoise and one-of -a-kind treasures! For this reason we scour the Southwest Pueblos up through Northeast towns and all the long and winding roads within in search of the next treasure we can offer to you. 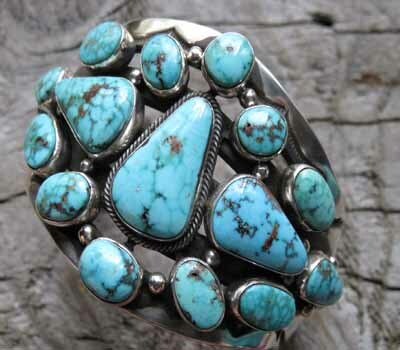 American Indian jewelry to most people is the combination of turquoise and silver. However, there are many beautiful pieces of Native American Indian handmade jewelry that do not use turquoise at all. Our American Indian jewelry we offer is handcrafted by the American Southwest tribes; primarily being Navajo, Zuni, Santo Domingo & Hopi. Artisans from each tribe have developed distinguishing skills throughout history. Navajo jewelry is most prevalent throughout the jewelry trade - displaying superb silver work, stone cutting and stone setting.They use a wide variety of gemstones in their work including genuine turquoise, coral, spiney oyster shell, jet, amber, gaspeite & lapis; with also the emergence of non-traditional gemstones such as amethyst, peridot and carnelien. Turquoise has been added to Navajo silver jewelry for many years, but they did not use the inlay technique to insert turquoise into silver designs until the past century. The Zuni peoples are famously known for their fine inlay work, preferring to work with Sleeping Beauty turquoise, jet and onyx. Designs are typically of Zuni symbols (such as the sun birds and corn maidens)and their sceinic and micro-inlay pieces are truly one-of-a-kind. The Santo Domingo craftsmen are highly regarded for their hand-rolled beadwork, artistically strung into multi-strand heishi-bead necklaces. The design-patterns, use of myriad gemstone materials and smooth graduating discs is un-rivaled. Hopi indians are predominately metalsmiths, using sterling silver and gold in overlay designs. 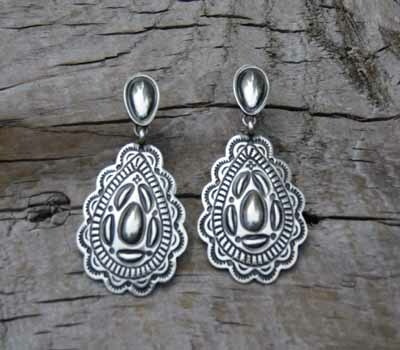 Since we offer other treasures as well, all of our Native American jewelry is noted as such in the description. Keep your eye open here of things to come because we do have some of our own treasures on the creating table, but like with all handcrafted jewelry it takes time to create these special pieces.